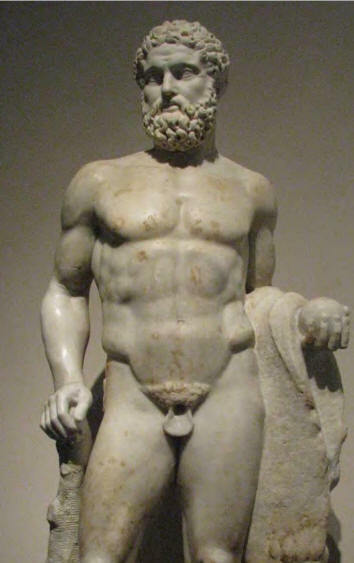 2nd century CE marble statue of Heracles based on a Greek statue of 450 BCE. The celestial marvels witnessed by our ancestors instilled a picture of superhuman involvement in the greatest events of mythology. As seen in part one, classical thinkers followed two strategies to justify the “humanity” of their major gods despite the clear astronomical nature of the latter: they would either adduce a story of catasterism, explaining how a certain “human being” was once placed in the sky as a star or a planet, or they would redress the celestial connotations of such gods as “scientific accomplishments” of the people they had been supposed to be. Although the disavowal of theism, implicit in Euhemerism, comes a step closer to a modern understanding of the “gods”, the fallacy at the root of this theory is exposed by the almost ridiculous abundance of early and virtuous astronomers the Euhemerists ended up with. Moreover, hardly any human society have dispensed with the astral component of myth entirely; no matter how persistently artisans and ritual actors modeled the gods on human beings, traces of the cosmic nature of these entities nearly always survived. In a structural way, the deathblow to Euhemerism is given by the comparative approach to mythology, as increasingly refined sets of intercultural parallels help to filter out universal motifs from incidental, secondary and local additions. Clearly, worldwide motifs such as a divine creator of the sky or a giant being upholding the sky with his arms are not satisfactorily explained on the postulate of a separate ‘real historical person’ for each individual case. A much more economic interpretation is that such motifs trace to forms and movements once observed in the sky by the people that devised the myths. Yet in that case, why did people worldwide tend to depict these gods in terms of human beings? A combination of two different factors may be at work here. Firstly, anthropologists point out that the concept of “ancestor” was a fuzzy one in most traditional societies, where the “totem” ancestor of a tribe or clan could be anything from a mammal, a bird, a plant, or a rock, to an actual human being. Inherited myths of the deeds of such diverse ancestors – all modeled on celestial apparitions – may only secondarily and by degrees have been interpreted as human ancestors in the modern, “meaningful” sense. Secondly, on-going interdisciplinary investigation suggests that the high-energy density auroral pillar accountable for much of “creation mythology” in various stages of its evolution showed a distinct human likeness. The column itself, bifurcated at its top and bottom ends and featuring radiant orbs at its apex and bottom, would have struck human observers as a giant luminous “man” looking down from the highest heavens. And the multitudes of glowing sparks emitted in this configuration would have vacillated in appearance between “stars” and little people frolicking in the sky. 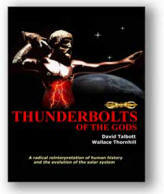 With this in mind, Euhemerism may be vindicated in the sense that many of the plasmatic prototypes of the gods and goddesses looked somewhat like human beings. But of course this is still very different from Euhemerus’ more down-to-earth belief that real people formed the first deities.